Spring is on the horizon, and what better way to start fresh than with a sparkling, clean kitchen? Every day chaos can leave behind messy, cluttered and disorganized kitchens. But, with these eight cleaning quick-tips, you’ll be off to a cleaner, more organized kitchen in no time. The microwave is often one of the most common culprits for funky kitchen smells. Brush out crumbs with a damp paper towel, then clean out cooked on food stains with ease using a spray cleaner, like Soft Scrub® Total All Purpose Cleaner Lemon Spray. It’s a great time to reset and inventory your pantry. Sort through your canned and boxed goods and figure out which items you are likely to use this year and which items have been in your cupboard since the last millennium. Get rid of those pesky stains from countertops with a cream cleanser that is specially designed to remove tough stains without damaging surfaces. Try our no-rinse Advanced Surface Gel for high-end countertop surfaces like granite and marble. Ovens can be notoriously difficult to clean. Make it easier on yourself by spraying the baked-on food with Soft Scrub® Total All Purpose Cleaner with Bleach Spray. Just spray onto burnt stains, let sit and easily wipe away. Bring your stained nonstick pots and pans back to their former glory with a nonstick scrubbing sponge and some Soft Scrub® with Bleach Cleaner Gel, specially designed to not damage the nonstick coating. Wipe away grease and grime and make stainless steel sink and faucets shine again with Soft Scrub® Advanced Surface Gel. You’ll be able to see your smiling face reflecting back at you when you’re done. Go through all condiments from the fridge, tossing any expired ones. Then, wipe down all the surfaces with a disinfectant spray. A clean fridge sets the precedent for a healthier life. 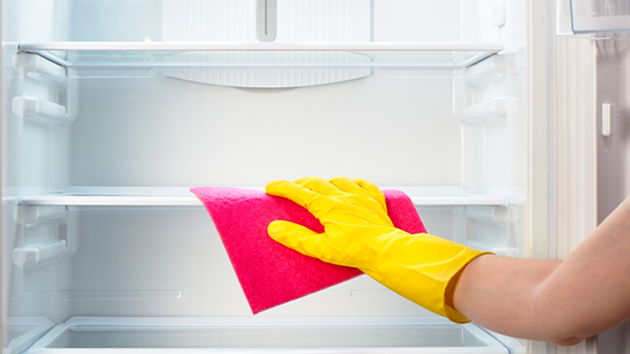 To really make your kitchen sparkle, make sure to clean up and disinfect your floors. Whether they are tile, linoleum, vinyl or travertine, a bleach cleanser like Soft Scrub® with Bleach Cleanser can be a great solution for squeaky clean floors.